As I've mentioned previously, I am a big fan of Lush's fresh face masks. 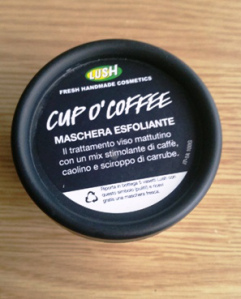 I'm also a lover of Frank Body scrubs, so when I spotted Cup O' Coffee in a Lush store in Florence (which is why the labels are in Italian), there was no question about picking up a pot. While initially targeted to a male market, I wasn't put off even a bit. Like a lot of people, I’ve always been quite wary of signing up for beauty boxes. On the one hand, it’s always exciting to get new things to try, but on the other, I’m always quite concerned that I’m going to end up paying about £10 a month on a load of rubbish.